Work on Team Yankee British has begun with a Chieftain troop. These models are such a joy to put together and are crisp, clean and beautiful. These models are very easy to assemble. Once free of the sprue everything slots together easily. You can’t mix up the tracks as they are notched to ensure they attach correctly. The guns are a tight squeeze into the turret but this is a good thing. I have not glued mine to allow for raising and lowering. This may be a design feature! Turrets are magnetised as they make keeping the turret in place so easy! I shall make a post about magnets another time as they come with their own – albeit minor – problems. The tank on the left is the troop commander so I’ve used the open hatch for the commander figure. 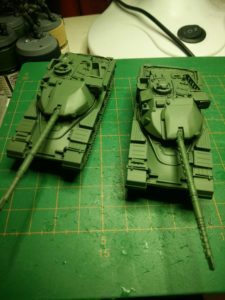 These two are spray base coated with Tamiya TS-78 Field Gray, the closest spray colour to Battlefront’s recommended Team Yankee “Chieftain Green” paint. I’m sure one can will not stretch to cover a whole army so I’m looking at alternatives such as Rust-Oleum Camouflage Ultra Flat Camo Spray in “Army Green”. What’s next for Team Yankee? I have a plan for adding camouflage, and these two are my test models. Waiting on assembly is the rest of the troop, a second troop, a company HQ, a platoon of FV432 APCs with infantry and two Lynx Heliarm helicopters. I’m very impressed with these Team Yankee plastic models.